Many of Creative Concepts NYC‘s clients like the idea of a tablescape, and miniature everything! 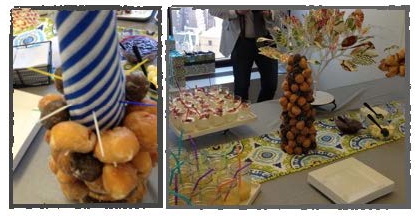 One of the many creative ways CCNYC accomplishes this is by making custom donut hole towers. They are super easy to make and fun, while adding much needed hight to a breakfast spread or themed event. Here is how all you DIY enthusiasts can get in on the action! left to right: The supplies- foam cone, tissue paper, toothpicks, & stapler. 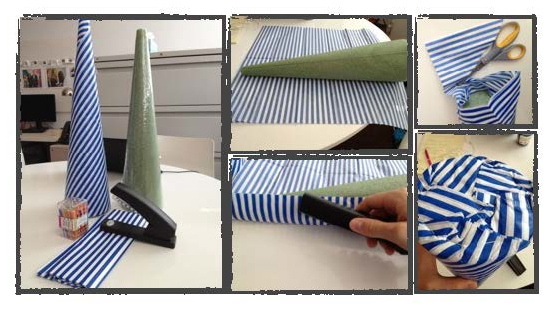 lay out paper and wrap while stapling along the way. cut off excess and staple to bottom. stick in toothpicks and attach donut holes.....it's that easy! This entry was posted in DIY with CCNYC, Uncategorized and tagged breakfast spread, catering, CCNYC, creativeconcepts nyc, diy, donut tower, event, food, inspiration, New York caterer, party, tablescape, themed event idea by ccnyc10168. Bookmark the permalink.